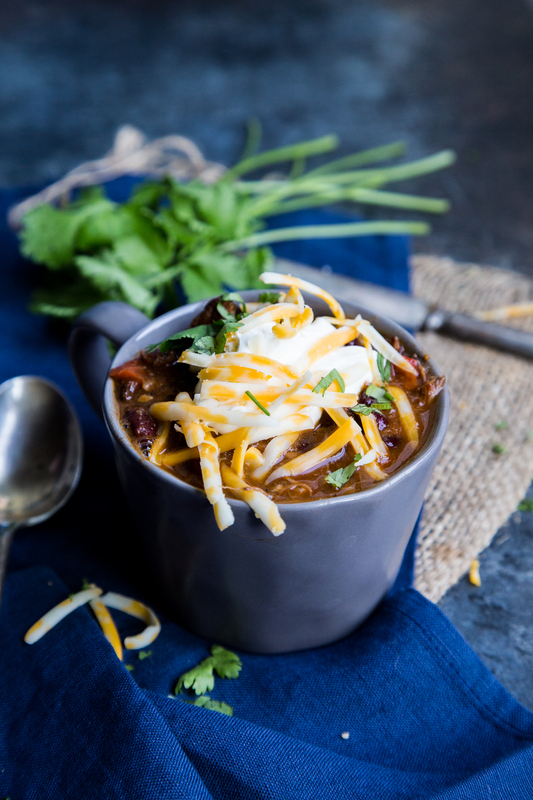 The ultimate chili con carne for all your cold weather days, or for watching football! 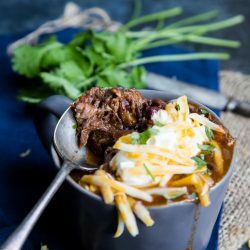 This low and slow cooked chili is packed with shredded beef, and beans, cooked low and slow and then topped with cheese for the most excellent chili con carne you have ever had! And it is epic on top of hot dogs for chili dogs! The first week of my life back to work is complete and I can tell you that I didn’t melt down at all! I mean, not until I got home after the first day and absolutely cried holding Emmett for the first time in 10 hours. the longest stint we had ever been apart. But I did it. Whew. And every day since has been easier in some ways. The distraction of work helps, but I know I can’t help but look at his photo every time my phone lights up, or put in some headphones and play the 30 second video I have of him chatting and hooting at me on repeat. Our little owl has become quite a chatty boy and I miss those little conversations through my day. At home it is a mad dash to get as much cuddle time with him in as possible, and still find ways to get dinner on the table for me, and Ben. I’ve already busted out our slow cooker, putting it to more use in the last three weeks than I have in the last three years. But that is good! I’m glad I’m finally using it. There have been plenty of times in the last three years that I considered just adiosing it to make room in my cabinets, but it is finally earning its place. Especially when it comes to being able to make the most INSANE chili con carne known to man. This makes a whole pot full, so it is great for a crowd or you need a dish to last a couple extra days for when you literally just can’t even break away from the kid to fix a whole new dinner. Dare I say that the leftovers might actually be even more awesome?? Well, football season is drawing to a close, and that means that SuperBowl is right around the corner. Every year we do a BIG thing at my dad’s house with all the family. 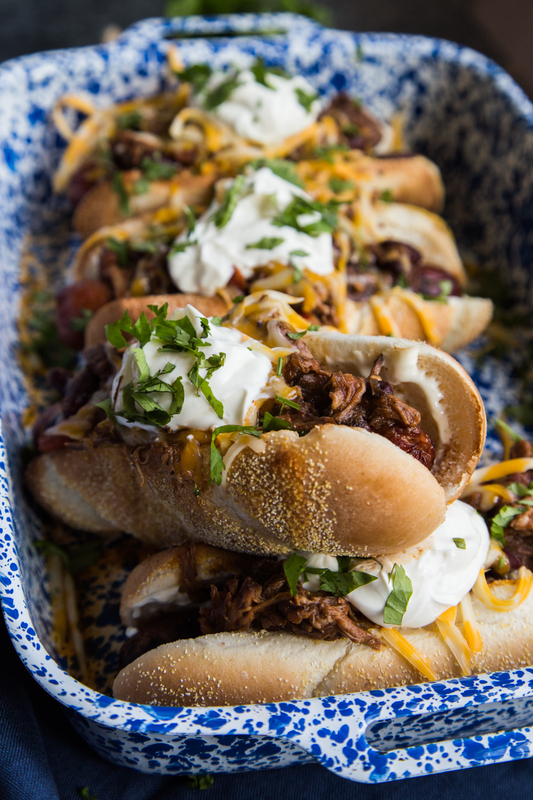 It will be Emmett’s first Super Bowl, and I know I will be making this and bringing some hot dogs to go with it for those who want to make this into Chili Con Carne Chili Dogs. There is never a shortage of food, but this one needs to make an appearance for those who want something more stick-to-your-bones than chips and salsa can provide. Remove beef from the fridge, and place on a plate, patting dry on all sides with a handful of paper towels. Cut the beef in half to form more manageable portions that fit into the slow cooker. Sprinkle all sides of the beef with Stubb’s Bar-B-Q spice rub, and allow the beef to rest for at least 30 minutes prior to searing. When it is time, heat a cast iron skillet with vegetable oil, and when the oil just begins to ripple and the pan is heated through, sear the beef for approximately 3 minutes on each side – or until it is deep golden brown on all sides. Add additional oil if needed. Set aside to rest momentarily. In the cast iron skillet, add in the onion, and bell pepper to the pan and allow it to sauté to deglaze the pan and any of the cooked-on bits of beef and seasoning. When the onions and pepper have softened, and the onions have become translucent, remove them from the pan and place them into a 6-quart slow cooker. Add in the remaining ingredients from the paprika through the ground pepper to the slow cooker. Stir the ingredients together, and nestle the seared beef into the mixture. 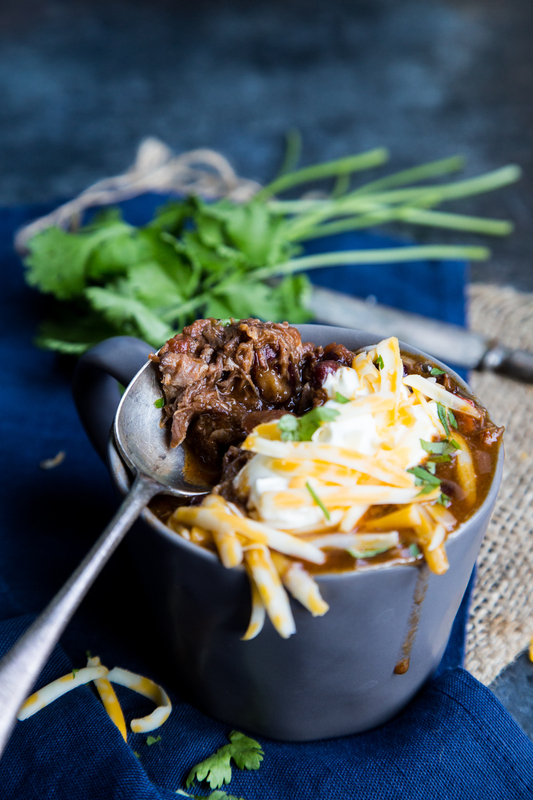 Cover the slow cooker and cook on low for 8 hours, or until the beef falls apart easily when shredded with two forks. Remove the beef and complete shredding the beef. Place it back in the slow cooker and stir to combine. Keep warm to serve. Top with shredded cheese if desired.